1. Heat the oven to gas 6, 200°C, fan 180°C. 2. Over a medium heat, add the sunflower oil in a saucepan, then fry the basmati rice gently until translucent. Add 200ml of water. Bring to boil then reduce the heat to a gentle simmer for 10 minutes. Remove from the heat, cover and set aside for 15 minutes. 3. Into another pan, melt the butter adding the leeks and garlic. Cook over a medium heat until all is soft but not browning. 4. Add the mushrooms into the pot and mix. Once the mushrooms start to release liquid, place all of the cod on top of the vegetables. Reduce the heat and steam for 10 minutes with a lid on top. 5. Remove the cod from the pan carefully and set aside. 6. Remove the pan from the heat and stir the leek and mushrooms with the rice. Add the sour cream and chopped dill. 7. Flake the cod and stir gently into the mixture. 8. Roll the pastry out as thinly as possible and cut into 12 equally-sized fish shapes. Set onto a baking tray lined with non-stick baking paper. 9. Onto 6 of the pastry bases, spoon some of the mixture ensuring that you leave approximately 1 inch gap at the edges. 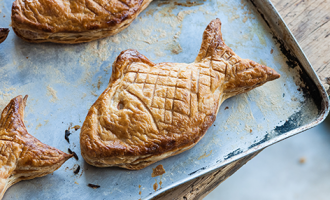 Top each pie with another fish-shaped pastry. 10. Crimp the edges of the pastry and apply an egg wash. Put into the oven for 15-20 minutes to bake until golden. Serve immediately.